Since 1908, B. M. Smith, Inc. has served South Arlington and greater Northern Virginia through management of multi-family and free-standing residential housing and commercial properties. The history of B.M. Smith & Associates, Inc. reflects the story of one family and its longstanding commitment to building community through principled development of housing and commercial properties. B.M. Smith's father, Henry W. Smith, immigrated from Canada, supporting himself by farming with his father. His entrepreneurial spirit led him to establish the Arlington Transfer Company in 1894, providing transportation along Columbia Pike and offering tours of Washington, DC, first by horse and carriage and later with five motorbuses. With the success of his first venture he then invested in The Blue Ridge Coal Company, located next to where the Pentagon exists today. He and his wife, Julia Shreve, lived at the northwest corner of Columbia Pike and South Courthouse Road, current site of the 2121 Columbia Pike apartment building. 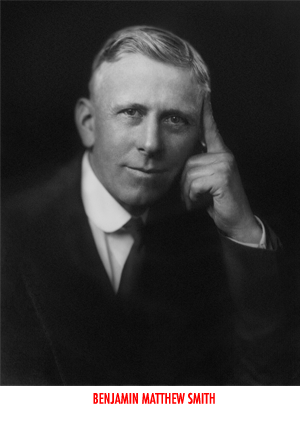 1908 – Benjamin Matthew Smith, following the entrepreneurial spirit of his father Henry, founded B.M. Smith, Inc. as a real estate business in South Arlington while maintaining active engagement in local, civic, religious and philanthropic organizations. B.M. Smith moved to the 2400 block of Columbia Pike and established his residence. This area was subsequently redeveloped and has a number of commercial establishments including Rappahannock Coffee and Roasting. 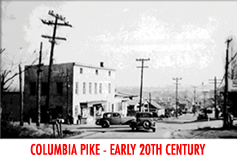 In 1932, Arlington County was officially formed. In its second year, B.M. Smith was appointed as an interim board member and in the two subsequent years served first as acting chair and then chairman of the Arlington County Board. B.M. Smith also was a member of the Arlington Hospital Board of Directors and served as Arlington County School Supervisor among many other civic activities. B.M. Smith sold the Buckley and Graham land tract of 53 acres to Gustave Ring, a well-known developer. Arlington Village, an award-winning apartment complex was built on this site, directly behind the 2400 block of Columbia Pike. In anticipation of the metro line coming to Columbia Pike, B.M. Smith built an office building one block off Columbia Pike at the corner of Wayne Street and South 9th Street. The Key Apartments were built at 2112 Columbia Pike. Smith family members subsequently purchased this apartment building in 1984. Henry and Julia Smith’s original farmland at the corner of Columbia Pike and Courthouse was converted to an apartment building at 2121 Columbia Pike. Benjamin M. Smith established an independent philanthropic foundation, the Washington Forrest Foundation (WFF), with the donation of real estate. Bob and Edith’s, Arlington’s oldest diner, was built on the homesite of Alice Petty (B.M. Smith’s sister). In 1972, B.M. Smith developed a third apartment building, 2200 Columbia Pike, on the southeast corner of Columbia Pike and Courthouse Road across the street from Henry and Julia Smith’s original farmhouse and land. Additional single-family units were developed on South 9th St and South Adams Street. During this period the firm grew to manage 29 commercial properties in South Arlington and the greater Northern Virginia region. The Rite Aid Pharmacy at 2820 Columbia Pike (originally Bob’s Big Boy) was built on the homesite of Cora McIntosh (a Smith family relation). Penrose Square residential apartment and commercial center opens. This multimillion redevelopment project of an older shopping area was undertaken by B.M. Smith & Associates to bring restaurants, shops, services, and upscale apartments to Columbia Pike’s Penrose neighborhood. B.M. Smith & Associates continues its longstanding commitment to the Arlington community while also investing in land and properties throughout Northern Virginia and locations across the United States. B.M. Smith supports the south Arlington community through participation in the Columbia Pike Revitalization Organization, support of Penrose Park community events, and participation in the Arlington Chamber of Commerce. B.M. Smith, Inc. looks forward to maintaining an ongoing presence and investment in South Arlington, home to the Smith family for over 120 years, while selectively expanding when meaningful opportunities arise. Our commitment remains one of principled property investment and management that benefits the local communities.